This one goes out to a fellow blogger, birder, and nature lover, with whom I made a pact what feels like weeks ago. I walk along slowly. Healthy living and what not. My attention wanders to the greenery to my right. There stands a large bush with many purple flowers, which had been there since before we moved in when I was 10. No need to wonder how long had passed since (it has been a good while). Two mature mango trees lean their branches over the fence as they have been doing for so long. The speed of the treadmill has become routine and so I turn it up a notch. There are some orange bird of paradise flower, a large-leafed shrub tree thing (yes, that be the technical name), several large spiky aloe-like plants, as well as two or three other boring green bushes. A fledgling almond tree and a young mango tree sit amidst this chaos somewhere, and here and there a purple-leafed plant lurks. My favourite, the coconut tree, is fruiting for the first time this year. I have decided to take this opportunity to note the avian visitors in the yard, because this early morning jog is likely the only time today I won’t be typing fervently. I increase the speed on the treadmill again as a Common Bulbul announces its arrival. The medium sized grey and black bird perches on the water tower across from me, looks around a while (probably wondering what that strange noise was about), then flies to the large leafed bush, disappearing from my sight after a brief pause at the top. The bulbul in the bush continues chattering. I was sure I knew what about. Three others soon perch on the tower, enjoying the morning sun. After a few minutes, the yard starts to come alive. What looks at first like a very buff bulbul swoops into the yard, but then I get a better look and see the yellow bill: an African Thrush. It makes for the bare ground beneath the coconut tree, out of sight. It is likely searching for insects there. It gives a call that sounds like nothing so much as a see-saw: about four pairs of back-and-forth notes. The thrush falls silent, and the bulbuls’ calls are the only sound for a minute. Then I notice one of the purple flowers twitch. I am tempted to turn off the treadmill (for science! ), but do not. There is a chirping noise now and then, a small bird flies out of the flower bush and to the shrub nearby. I finally catch a glimpse of the responsible party. I am pleasantly surprised to see the Mangrove Sunbird also called the Brown Sunbird, more so than the Bulbuls (sorry, Bulbuls! ), because well, who doesn’t like sunbirds. I am certain that this bird is a migrant (an animal that moves at certain times of the year to different places), though it likely does not travel very long distances. I hadn’t seen it for months! And it isn’t alone. Two others are in the bush, wreaking havoc on the proffered supply of nectar. Obviously it has had a good trip away and returns triumphant. It moves back to the flower bush, executes an enviable acrobatic maneuverer, and takes a long drink from one of the flowers. I move the speed on the treadmill up a level, and I start to jog. The calls of birds continue, and I see a few swifts swooping through the air. A couple of kestrels fly past, and in the distance, I see another long absent bird. The Yellow-Billed Kites have returned. They had been conspicuously absent from the skies these last few months. These kites, documented migrants, travel south around this time every year, but most people don’t notice their absence or their return. Soon these scavenger raptor will be seen every where. I can’t say the same for the sunbirds, who are more specialized. I start to wind down, walking now. The migrant birds occupy my thoughts. The rains are about to stop, the breeding season may be starting, and flowers are blooming. This means that migrants from further away are soon to arrive here to exploit all the resources offered. A bulbul flies to the coconut tree and tries for some nectar. If there are any resources left. It disappears into the mass of yellow flowers, unconcerned with this bird photographer, and only comes into sight again to greet another Bulbul visitor. Snap! I see a small bird flitting in and out of the mango tree in the distance. It doesn’t come close enough to identify to a species level, but the long curved beak and size suggest a sunbird. I am fairly sure there have been no sunbirds around the last few months. I hear the squawk of a starling nearby. Those guys have been here all along, but it’s nice to know they’re still there. They don’t seem the least bit affected by the return of the sunbirds. Ah, to fly away to a different place on a whim like one of these feathered travellers! For now, I’d accept just flying away inside to get a camera! Two minutes to go. I hear a couple of doves call, Laughing Dove and Red-Eyed Dove, and again the starling. The mysterious sunbird returns to the mango tree. Time! I take off running, fetch my camera, and capture the bird life around the yard. :))) I got what I could manage. The birds were compliant without meaning to be, being happy with their foraging locations, they remained and the pictures fit nicely to the story. I even got lucky with the sunbird in the mango tree. Looks like a female Buff-throated Sunbird. Definitely wasn’t here before. And I photographed the bird of Paradise (flower). It could be bothered to hold still, you see. Until next time! Who knows what new visitors will be here then. Today I am going into a forest. A mangrove forest. So, basically a swamp. Over the last decade or so, the area has been filled in with debris, rocks, and sand by the local people in order to make suitable platforms for building. And it is working splendidly, if slowly. In a few years it will be dry land, and the mangrove plants will dry out, too. The area has already been cut off from the primary water body that supplies the swamp. This is sad, but it only drives me to survey the area while it is still a suitable habitat for mangrove swamp birds, and perhaps record the changing species composition. Every trip here is an adventure because I am not sure what will have changed since the last time I visited. I step off the road and take a winding path down the hill. The usual Splendid Starlings, Pied Crows, Cattle Egrets, and Common Bulbuls are going about their morning routine around the existing and upcoming housing structures. All three doves that occur here (Red-eyed Dove, Laughing Dove, and Blue-spotted Wood Dove) call from nearby or fly in front of me. I log them in my bird watching app and forge further away from the road. I double check with the book, and verify that this is a Common Moorhen. I love the colors on this bird! I idly wonder if it is related to a Greenshank which has legs the same color, but realize it would most likely be related to the Double Spurred Francolin, another bird which, unreasonably, walks about a lot. I move on, from the spot and the thought. I have been birding for 20 minutes when I heard it the first time, sharp and clear, a whistle in three parts: whee-whe-whee! I record the Common Wattle-eye (heard). It’s good to know it’s here! I see three birds off in the distance, one a beautifully patterned black, grey, and white. It has a tuft of feathers on his lower back that looks like nothing so much as a fluffy grey tutu when it flies. The other two are brown, with subtle streaks on their breasts and necks. This could mean an adult and two juveniles or a male and two females. All three have striking red eyes. They are quite far away, and seem to be involved in a heated exchange, or maybe an exchange of pleasantries. They take off before I get a good shot, but it’s the first time I’ve seen the Northern Puffback here, so I’m pretty excited. The elusive wattle eye calls again, from a different direction than I was heading in. I change directions. I am determined to see the Common Wattle-eye today. I am a very sight oriented person and birder, and heard records are not my favorites, unless I’ve already seen the bird that day. A trio of sunbirds fly past, chattering away. I drift towards the small tree on which they have perched. No need. The green head and throat on a pale grey breast one tells me that these are Green-headed Sunbirds. The two females have green caps, but no green on their throats like the males. I return to the path to the Wattle-eye, but he has fallen silent now. I follow a flash of blue, sure of the species before it lands. The orange beak and blue and black pattern on the wing are unmistakable. It finds a nice perch on a mangrove stem and just sits. After a minute of watching it, I lose interest (for shame, what birder is this??) and look around again for other things. I guess this trick works on insects, too, because the kingfisher takes off from his perch then and snatches one up in his beak, and returns to its perch. It whacks the insect against the stick a few times, then eats it. It returns to sitting innocently on the stem. The kingfisher will repeat this exercise often, unless something drives him from his perch or the insects available dwindle. This is a Woodland Kingfisher, but many Liberians call this bird a blue-jay. Perfectly understandable, as the blue on his wings is the most distinct thing about him, if you’ve never seen him fish for insects. I move on, to see a bunch of waterbirds: two more Moorhens, a Squacco Heron, five Intermediate Egrets, and a Western Reef Heron. I walk across a small bridge, and several swallows swoop past, turning wildly in the air around me. It’s difficult to narrow it down to one species, because they are flying past so quickly. All I can see is a flash of white belly and dark blue back. Luckily, one of them perches on a stake a little ways away. I move closer, and note a chestnut colored (rufous) circle on its forehead. Its throat is a cream color in contrast to the white of its breast and belly. I’m sure now these are Ethiopian Swallows. I remain uncertain of their number, because they swooped past me so many times I lost count, and had no way of knowing if these were returning individuals. Alas. A small bird flies ahead of me, and in the stretch of ten seconds, occupied four different positions in the shrubs. Warblers, man. The bird is a dull golden color, with a streaked head and wings. Its eyebrow stripe (supercilium) is a slightly lighter color, and its bottom beak is pale. It has a dark stripe across the eye, and two such almost matching stripes across the wings. I take a quick photo before it disappears behind the foliage again. That’ll have to do for now. The bird, a Sedge Warbler, takes off again, obviously in a hurry to mock some other birder. A black and white bird about the size of a phone flies past, keeping close to the waterline. It looks like a small flying zebra. Ridiculous I know, but now that image is stuck in your head. You’re welcome. It hovers above the waterline, dives down, and then perches off in the distance. This bird, a Pied Kingfisher, is one the largest hovering birds. Most birds fly, obviously, or soar on the currents, but this Kingfisher is the largest of those few birds that truly hover. Hovering in birds refers to beating their wings in a way that allows them to remain aloft in one position for a period of time. The hummingbirds of the Americas are the smallest hovering birds. It has been an hour, and I must start to return the way I had come, along a different path. I want to see the wattle-eye, because I haven’t seen this species in Liberia before, and because I assume that if they were calling to each other, one of them must be a female. I’d never seen the female of the species before. I go to the music folder on my phone, and search ‘wattle-eye’. The search results gives several, but I select ‘Brown-throated Wattle-eye’. The bird is odd because this name is taken from the female. Many birds are named for the males, you see. 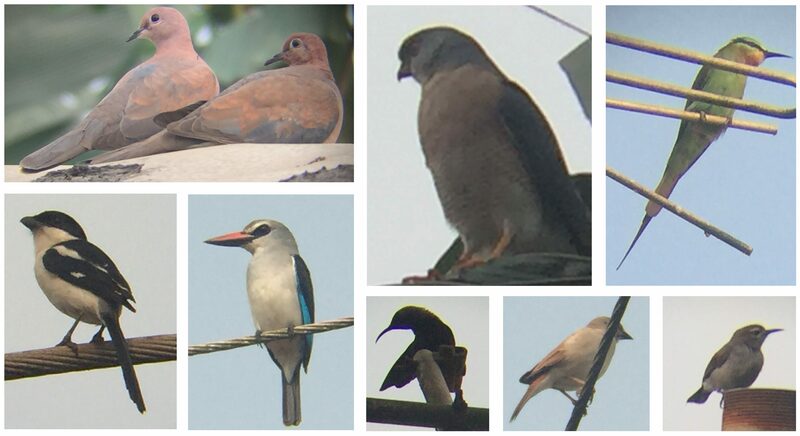 Pin-tailed Whydah, Scarlet-chested Sunbirds, Citrine Wagtails, Red-shouldered Cuckoo-Shrike, Northern Red Bishops, Red-cheeked Cordon bleus, and Indigobirds are all species whose females have none of the nominate features. Basically, if I see a flamboyantly colored bird, I assume it is a male. I am still wrapped in the haze of my victory when I hear the buzz of a prinia. My head snaps that way. All I see is a shaking bush. I know that within is a Tawny-flanked Prinia mocking me just out of sight, with an almost intentional shaking of the bushes, so much movement for such a small bird. At least it is giving me more than the Wattle-eye had initially. I could stare at the bushes until I catch a glimpse of the shaker, but why should I? I know how to deal with this problem now. A half minute later, the call of the prinia rings out from my phone, ‘dwe-dwedwe-dwedwe’. A bush shakes to the left, and I turn. The call sounds again, and a little grey head pokes out of the bushes. The call sounds a third time, a faster variant, and the prinia in the bush responds. Dwedwe! It wasn’t a challenge, it seemed more like a ‘who’s there?’ He remains there long enough for me to take his photo, then I stop the playback and he returns to his foraging exercise. I greet the builders as I move out, already planning the next trip. This has been a good day for swamp birds. The forest is quieter this afternoon. I move into the forest, on my newly discovered path. I wonder if I will see any birds. As that thought crossed my mind, there comes the sound of flapping wings, and a bird moves away from me into a tangle of bushes ahead. I stare hard at the place where it had landed. I am pleasantly surprised to see a dark eye staring back at me. Perfectly still but for the craning my neck, I watch the bird. It has a beautiful blue-grey face, but I don’t see very much else of it. It takes off as suddenly as it had the first time, in a flash of rich brown and grey. I note the demarcation of grey on its head, and body shape. This is one of the doves, and a new one for me. It is a Blue-headed Wood Dove. I guess I had missed the green patch on the wing in its hurry. Already I am heartened and glad I came out into the forest this afternoon. I spot a small bird moving around in a high shrub just ahead. It is yellow and white, and small, probably small enough to fit comfortably in my hand, and appears very immersed in its task of pecking at the trunk of the tall shrub-like tree. I move closer, and it flies off again. I have an idea what it might be, so I play the bird’s call on my phone and wait. Immediately I hear several responses to the last sound in the loop. A few minutes later the bird, or another just like it, returns. It responds to the call, twitching this way and that way to find the caller. I get a closer look at it: It is yellow, green, and white. The wings and head are olive-green, the face and derriere yellow, and the breast white. Its beak is dark and so are the eyes, and it has orange legs. I take a few shots. I stop the call and the Yellow-browed Camaroptera remains a few seconds, then flies off again. I start to move again, but stop as another small bird flies in. It appears to have come here in response to the call, because it doesn’t seem to be feeding. It has a sunbird’s bill, but it appears quite large. The top mandible is dark, and the bottom one is a bit pale close to the head. It is completely olive-green, the belly slightly lighter than the back, and has no other colors. This is an Olive Sunbird. I look in the book, and notice an orange spot on the wing in the illustration, but when I look up again, the bird is gone. I move on, past the small opening, and come to a stand of tall and thin trees. There are many species flying around here, and calling. I focus on the small one about half way up the closest tree. It is about the size of the camaroptera, and has a black cap, white throat and neck, and black breast and wings on a white belly. I take it for a batis or wattle eye, but the female flying next to him quickly helps me make the choice. This one has a grey cap, brown wings, a white belly, and a light dusting of rust on the throat and breast in the same shape as that of the male’s black bib. This is a wattle-eye, specifically, a Chestnut Wattle-eye. They are too far away for a picture. 😦 I focus on a bigger bird next for that very reason. This is a bird twice the size of the wattle eyes, but it looks almost three or four times the size because of its long tail. It has a beautiful rick reddish-brown body and a black head with a short crest poking off the back of it. It’s bill is a lighter shade of black, noticeable because of the strong black of its head. This is a Red-Bellied Paradise Flycatcher. Higher up I see the Black-headed Oriole from this morning again, but it is no more willing to pose than it had been then. There is a dead stump sticking out from one of the trunks, and staring at it, I realize that what I had taken for an extension of the trunk is the breast of a woodpecker peeking around it. The green-brown blends perfectly with the rotting bark, and the light spots on it seem like fungus. It moves off, drills at a section of the tree, and returns to the dead stump. That is probably its nest. My hunch is confirmed a second later when it disappears into the stump not to return for the rest of my stay in the forest. Ah, well. I record the buff spotted woodpecker, and look for other birds in this tiny hot spot. Instead I hear the bushes ahead shift and a guttural call sounds. I move quickly towards the area, expecting a large ground-dwelling bird (Nkulengu Rail, Nkulengu Rail, I chant in my head). I get closer, and the sound comes again. A large bird flies up from the undergrowth and I see a flash of colors, green, blue, red. Wow! It lands in a tree ahead, and I notice a yellow bill on a green head. It’s color pallet already gave away its family, and the yellow bill the species. The turaco has a green head with a thin white and black line on top. The wings are blue, and the red I had seen below peek out from under the wings. Its tail is hidden, but I know it is also blue. It moves into the foliage before I can get a picture. I hope to get a picture of the Olive sunbird, and play the camaroptera’s call again. A small bird flies past me, and lands near a vine with flowers on it. My heart leaps, but this is not the Olive Sunbird. I hold still and watch it anyway. It is a small sunbird, with a yellow belly, and a green breast and head. The green looks almost bejeweled. Two others join it and they begin to call to one another. These others have more yellow and move around a lot. I focus on the one that is sitting and take a quick shot. I stop the call when it becomes repetitive and the three Collared Sunbirds fly off. I move on. Movement high in a tree draws my attention. A small bird which reminds me a lot of a prinia is moving around the leaves near the outer edge. I watch the area for a while, and catch several quick glances before it takes off. It has a rufous brown head and a greyish neck. Its eyes are bright in a greyish face. It has a prinia’s tail, noticeable because it swishes it around a lot. But this bird is not a prinia. The flycatchers are another species which have long tails, so I check the plate, and there! This was a Chestnut-capped Flycatcher. I am surprised to note that I have already been in the forest for an hour and a half. I start heading back to the camp. I have As I do, a bird calls, a turaco from the sound, but unlike the turacos I know. I move out of the forest and towards the stand of trees on the road to the camp where they are moving around. They are large birds, about the size of my torso, plus their long tails. The turacos are beautiful, with their blue-green bodies. They have large crests on their heads, in a much darker shade than the rest of the body, grey faces, and it has a parrot’s yellow beak, tipped with a dash of red lipstick. I miss the lime green belly and red underparts, but there is no mistaking these birds. They fly off one, two, three as I approach, but the last one takes its time, so I snap a quick photo from afar. I am quite satisfied with the birds of today, but even walking back to the camp, I see more. A bird peeks out from a bush close to the building which houses the offices. It has a completely grey body except for the beautifully matched shade of its green wings. I have seen this bird before, but I am surprised by how different it looks. This is a Grey-Backed Camaroptera! It moves into the bush, and familiar with this species, I move on. Another small bird flies over the roof of one of the structures to perch in a tree close by. It is a light shade of olive green, and has a dull cream colored belly and throat. The black beak blends with the thin dark mask across the eyes, and there is a light stripe above this. It looks up, and briefly appears to have an orange bill.I watch it for a little while, but conclude that this was a trick of the light. It moves around, conforming to its Warbler heritage. I record the Green Hylia and let my mind wander, still listening and watching for other birds. I vow to go deeper into the forest on my next trip. There lie undiscovered (probably) species of birds and beasts. I turn to watch the sunset over the trees. This morning I woke an hour before the usual time. I know there are three good hours of birding to be had, and have them, I will! My gear is already packed, my field clothes already set out. A short yoga session and a shower, then I’m off. There is no time for breakfast, but I am un-bothered. Why? Because I am breaking new ground today! My birding destination of the day is Harbel, near the Firestone Rubber Plantation. After an hour’s drive, we arrive at the site. Gear at the ready, I scan the surrounding area for birds. I want my companion to enjoy the birding experience, so I’ve brought an extra pair of binoculars for his use, my phone has the bird calls ready to play, and I am prepared to divulge the secrets of digi-scoping, too! Binoculars and bird guide at the ready, I point off the road to the left at the first bird, a swallow. “Take a close look at the bird. Look at the colors on the back, on the belly, the shape of the tail.”, I tell him. He does, briefly. Then, “It’s moving too fast. That’s why we call it a tactic bird…because it does all these acrobatic tricks in the air.” We laugh, and after some practice, he gets the bird in his sight, and picks out the closest fits from the plate in the bird guide. The mud colored patch across an otherwise dark back, and a dull sunset color on its belly identifies it as a Red-Rumped Swallow. There are eight or so of them swooping and twirling in the air around us. They seem to have come to the newly planted farm off the road. We move on. There on the branch of a tree to the right out next bird species is poised. A sharp long beak and slightly curved beak and a strikingly patterned face announce its name. His beautiful long tail tell its life stage. “Keep looking at it, get as good a look as you can before it flies away.” I warn. Then, ignoring my own advice, I place the camera lens of my phone against the eye cups (looking area) of my binoculars. I take a few shots, noting as I do that the skies are a bit darker. “The long tail,” comes the immediate response. “Quite right. Now, that’s a bee-eater. You can tell by the bill. It mostly eats insects. Now these are the bee-eaters which have tail streamers. Which one does it look like?” I flip to the bee-eater plates and hold out the field guide. “And it’s an adult. You can tell because it has tail streamers.” I add. And so we had our second species. It had been five minutes since the start of the trip. A couple more swallows fly past. The air suddenly gets cold, and a few drops of rain fall. I shift nervously from foot to foot. A flock of 8 birds flies past, but the sun is blocked out, and we don’t see them very well. More rain falls, light but steady now, and we start moving towards the road again, expecting a full downpour soon. It is, after all, the rainy season in Liberia. There comes a call from the foliage nearby, made by three distinct voices. “Do you recognize that call?” I ask. “That bird is everywhere, I hear it in the morning at my house.” Luckily at that moment, one of them pokes its head out from the palm tree. “Why is it called the pepper bird?” I ask. “You see them a lot in pepper gardens,” comes the response. I nod, having no rebuttal to that. I know this bird as a Common Bulbul, but I am sure that the reasons for that name was no more sensible. The rain lets up soon, and I breathe a sigh of relief. The skies brighten. A short series of buzzing calls comes from a nearby bush, and we move closer. The call sounds further along, and we move again. I recognize it, but remain quiet. I know that some Ashanti people of Ghana have a name for this bird, and I am curious if it is the same here. But the Tawny-flanked Prinia or as the Ashanti call it, ‘Dwe-Dwe’ apparently has no local name here. It eventually shows it’s head again, and I try to capture the bird, quickly before it takes off, to perch for a few seconds on another branch, and another, and another. Warbers, am I right? Another flock of small birds flies past us, and perch all over a dry bush nearby. “Look there!” I tell him. This flock can only be mannikins. Their black and white plumage doesn’t help us narrow it down much. A closer look is needed. We creep closer, and they remain. I zoom in on one, a male (the females are a dull shade of brown, completely unhelpful for identifying the species), and snap! We get close enough to note how high on its body the white pattern goes, how different the top part of its beak is from the bottom part. Got it! It’s a Black-and-white mannikin. The matching silver of the top and bottom beak gives away his identity. The flock takes off suddenly with not a peep between them. Alas, we had crept too close. “That bird looks like the tehn-tehn bird,” my companion idly comments. He shrugs. “Any of the small birds are tehn-tehn birds,” he states. I nod and store this information away. A few seconds later, a yellow and green bird flies up and returns to perch on a stalk in the distance. We stare in that direction for a minute before picking the bird out from the leaves and grass. It has chosen its perch well, and likely for the very fact that it blends in well there. We watch this bird for a while. A short while later, a different pair the same species perches on a high branch near us. I encourage my companion to capture them this time. Bee-eaters love to perch and pose, so there isn’t as much hurry here as perhaps if it had been a warbler species, like the Prinia. We consult the book again, and name this a Little Bee-eater. We note some movement next to some recently burnt areas on the farming plain, and follow it. After a full minute of staring at the area, the bird moves again and we latch onto it with our binoculars, and we take the opportunity to get a good photo of it. At this point, we reach an intersection with the main road, and the bikes and cars roaring past make it difficult to hear the birds. The people walking past scare off several birds, regarding us curiously. My companion seems bothered by the strange looks they gave us. I revel in these looks. It helps me understand how the birds I ogle feel. However, I can revel anywhere, so we hail some bikes and move to another location. This has been a good start, and I know I will return here again soon. My companion mentions that we are going to a place near the dam, and I my mind drifts to waterbirds. But that is a story for another time.